Have you ever wanted to track where your code is deployed? 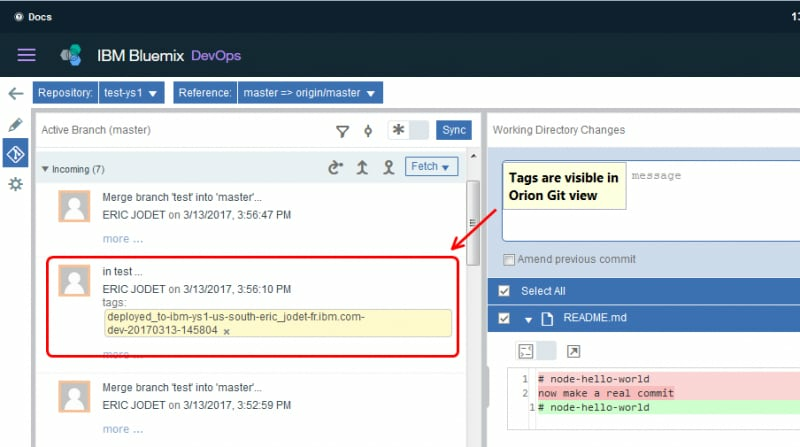 With toolchains in IBM® Bluemix® Continuous Delivery, you can now track code deployments through tags, labels, and comments in your Git repository (repo). For example, take a toolchain that includes Delivery Pipeline and uses a Git repo from the IBM hosted Git Repos and Issue Tracking service as an input. After the pipeline builds and deploys your app to your staging environment, the toolchain adds the deploy:staging label to your issues. You can then filter by that label to find out which fixes are in staging. Each deployment creates a tag in your Git repo. You can find out which commits are deployed in an environment by selecting the tag. Comments that include references to the environment and the automated build system are also added to the issue. You can easily navigate to the deployed app or to the job that deployed the app from your issue-tracking system (Issues) or from your source-code management system (Git). In addition, if your toolchain contains IBM Cloud DevOps Insights, DevOps Insights can apply analytics to your tags and labels to provide insights into your project. 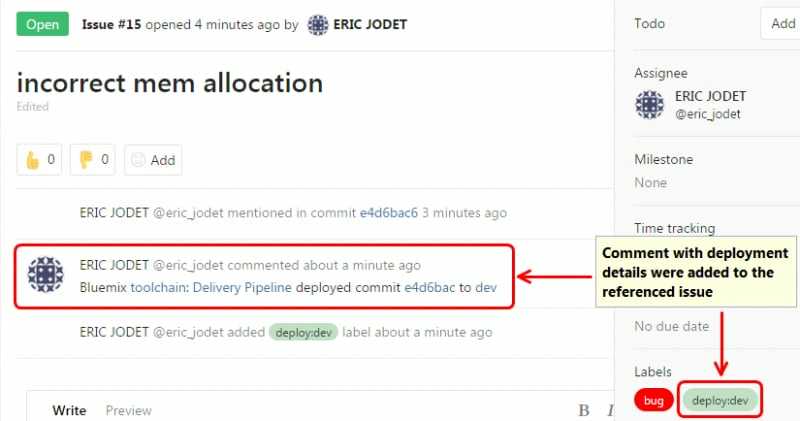 After the toolchain deploys your commit, any issues that are referenced in the commit’s comment are automatically updated with a comment and label. The comment that is added to the issue contains the deployments details and links to the related components, including the toolchain, delivery pipeline, commit, and the deployed app on Bluemix. You can create custom issue queries that are based on labels to track the issues that are deployed to an environment. Each time a commit is deployed, a tag is created that shows all of the commits that are included in the deployment. In the Web IDE, you can see the tags in the Git commit history. You can try this new feature in two ways. Create a simple Cloud Foundry toolchain from a template by clicking the Create Toolchain button. In the toolchain, the code deployment and issue-tracking feature is enabled by default. On the Toolchains page, select your toolchain. Right-click the Git repo card and click Configure. Make sure that the repository type is Existing, and select the Track deployment of code changes check box.